Everyone knows that feeling of helplessness when you’re passing a semi, and you start to see them gravitate to your lane. Should you slam on the brakes? Speed up, even though you’re already doing 10 mph over the speed limit? Honk? 18-wheelers can be extremely dangerous on the road – not because they are bad drivers, but because of the dangerous vehicle that they operate. 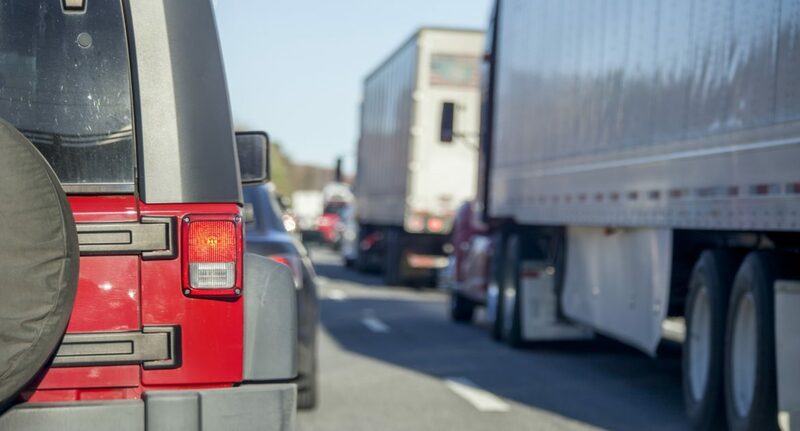 Semi-trailers are usually about 53 feet long and have very large blind spots, so it’s important to know how you can be safe while driving around them. Know their blind spots. The back half of their trailer on both sides is a common area for truck drivers not to be able to see, as well as directly behind the trailer. Steer clear of these areas! An easy rule of thumb is if you can not see the truck’s side mirrors, then they can not see you. Do not make sudden stops or drive aggressively when around them. We all know that 18-wheelers can not stop on a dime, so stopping in front of them quickly puts you and the truck driver at risk. Never speed dangerously around a semi, as they might not see you sneak up on them. Make sure to use your signals. Giving the semi plenty of time to prepare for you to come into their lane and making sure that they know where you are headed will cut down on the opportunity for accidents to happen. Anticipate those wide turns! Trailers are no smart cars, so their turns can be very wide. For some, they must use the middle lane to turn right – so don’t get caught in the right lane when they’re turning! When stopping in a turn lane at a stoplight, never stop past the line – it’s intended to make sure that trailers can make the turn without hitting you. Use common sense. Driving aggressively around semis can only boost the chance of you getting into an accident. Honking or trying to make a truck driver go faster will not help the situation and will only make everyone involved angry. Another thing to pay attention to is the weather – this makes a large impact on semi driver’s driving. If you get in an accident with a semi-trailer, the odds of being severely injured are high – so always wear a seatbelt when you are in any car. Cutting back on distracted driving can only improve your driving skills, and will help you notice any troubling drivers around you. If you have been in an accident with a tractor trailer, call Tad Morlan. Whether the driver is to blame for being reckless or distracted, or the trucking company for not having equipment that is up to par – we will fight for you!